Web PHP Proxy is a newly developped web based proxy. Web-php-proxy.com can help you to access MySpace, Bebo, Facebook, YouTube, Orkut, Friendster and MILLIONS of other Online sites that are blocked, using a web proxy. They released a new IM bot today, which can be used to surf the web more convenient, more faster. 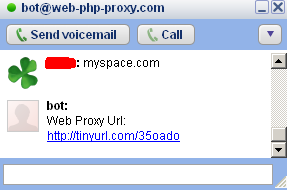 If you are a Google fans like Charles, who likes using Google Talk, just add this email bot@web-php-proxy.com to your buddies lists, and when some URLs can not be opened, just send this URL to this bot, and then it send back to you a tinyurl shorterned RUL, try to open this URL in your browser, and the site which you previously can not be opened will displayed in your screen instantly!